The last post explained the problem with future funding of Social Security & provided a solution based on Susan Lee's column in the WSJ dated November 23, 2004 entitled All You Need To Know About Social Security. Had the points from Dr. Lee's column been followed, when written fourteen years ago, Social Security would be a solvent program today & Americans would have a much improved mindset regarding limited government, personal responsibility, & free enterprise – the founding libertarian principles of America. 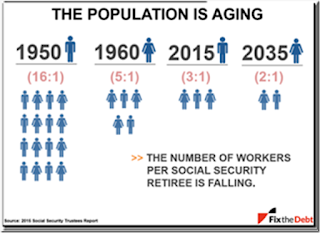 Although time is running out before the demographics described in the column just cannot work we still have enough time to avoid the obvious predictable financial shortfalls, suffering, & distress that will be realized by unsuspecting people who are counting on Social Security in the not too distant future. I hope everyone who read the preceding post & understood it can help make the solution described therein a reality. In a similar vein this post covers Medicare problems & solutions. In brief, the problem is that Medicare Part A is facing a funding shortfall that will require a 12% reduction in hospital benefits by 2029 & the cost of Parts B & D, which are 81% funded by general revenue from the Treasury, are growing too fast to be sustained. The solution is to implement a premium support system, unindexed to inflation, that will wean people off the Medicare program before it overwhelms our ability to pay for it. The Boards of Trustees for Medicare issued their most recent annual report to the Congress on July 13, 2017 regarding the financial operation & actuarial status of both the Hospital Insurance program (Medicare Part A) & the Supplementary Medical Insurance program (Medicare Part B & Prescription Drug Coverage – Part D). The technical information & graphs in this post regarding the Medicare problems are principally based on the aforementioned report entitled 2017 Annual Report of The Boards Of Trustees Of the Federal Hospital Insurance & Federal Supplementary Medical Insurance Trusts Funds – click on link to read the entire report – the 52nd annual. On July 30, 1965 LBJ signed HR 6675 in Independence, Missouri & former President Harry Truman was issued the first Medicare card. The Medicare budget was $10 billion & 19 million individuals were enrolled. Medicare coverage took effect in 1966. 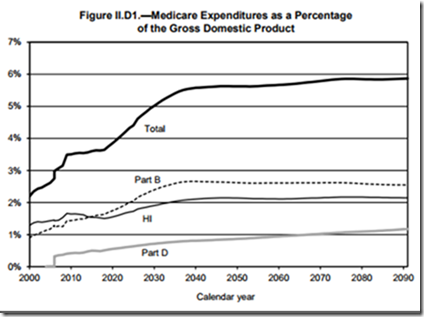 By 2016 the program had grown to cover 56.8 million Medicare beneficiaries & total expenditures were $679 billion. 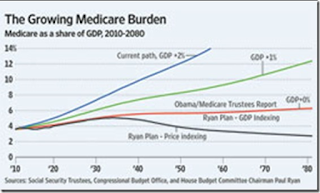 The Tax Cuts & Jobs Act of 2017 did not directly affect Medicare; however, in previous legislation there are mandatory spending cuts to Medicare that can occur as a result of deficits - but these cuts were waived by Congress as part of a temporary spending bill to prevent a government shut down in December. Medicare has two separate trust funds, the Hospital Insurance Trust Fund (HI) & the Supplementary Medical Insurance Trust Fund (SMI). The Medicare Part A HI trust fund is financed by the payroll tax on covered earnings, 1.45% of worker's wages paid by both the employee & employer, plus an additional 0.9% tax on the earnings of high income workers, defined as $200,000 per year for individuals & $250,000 for married couples, plus a portion of the Federal income taxes that some Social Security recipients pay on their benefits, as well as interest paid from the general fund on the U.S. Treasury securities held in the HI trust fund. The aforementioned income thresholds that make people responsible for the additional 0.9% HI tax are not indexed for inflation & it is estimated that 79% of workers will be subject to this tax by the end of the long-range projection period covered by the report. The taxation of Social Security benefits also is not indexed for inflation so more people come under it every year. Medicare Part A (HI) helps pay for hospital, home health services following hospital stays, skilled nursing facility, & hospice care. 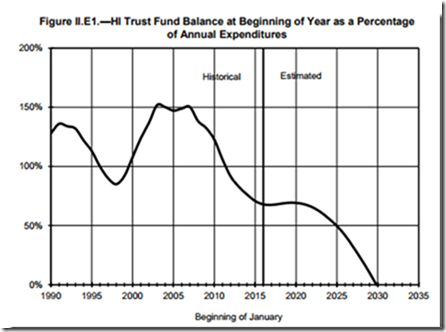 The HI trust fund is projected to be depleted by 2029 @ which time it will be able to pay only 88% of the hospital & related expenses it is responsible for under the Medicare program. See graph below. The Medicare Part B portion of the SMI trust fund helps pay for physician, outpatient hospital, home health, & the like for the aged & disabled who have voluntarily enrolled. The Medicare Part D portion of the SMI trust fund provides subsidized access to drug insurance coverage on a voluntary basis for all beneficiaries & premium & cost sharing subsidies for low income enrollees. Eighty-one percent of the Medicare SMI trust fund that cover Medicare Parts B & D is financed by transfers from the general fund of the Treasury meaning that the government pays over four-fifths of the physician & prescription drug costs of the 47.8 million people aged 65 & older & the 9.0 million disabled covered by Medicare. Premiums, including late filing penalty fees & Part D income-related monthly adjustment amounts charged to high income earners make up the rest of the costs. 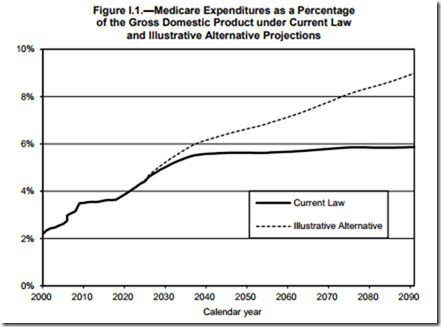 See graphic below that shows the Medicare Parts B & D expenditures & premiums on both an historic & projected basis as a percentage of GDP based on current law. Based on current law total Medicare expenditures (Parts A, B, & D) represented 3.6% of GDP in 2016, are projected to climb to 5.6% by 2041, & then level off asymptotically just below 6.0% of GDP for the remainder of the projection period covered by the subject report. See graphics below. 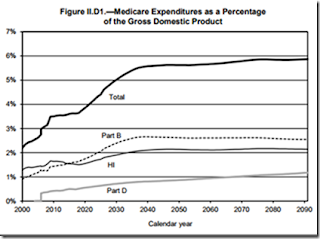 Like Social Security, the Medicare problem, with 10,000 baby boomers reaching age 65 every day, is that its costs are increasing significantly faster than that of the U.S. economy thereby making the Medicare program financially unsustainable. The above statistics & graphs are based on current law which include a significant one-time reduction for most physicians starting in 2025 followed by a slow rate of reimbursement growth that is notably lower than projected physician cost increases – i.e., it is not going to work when projected costs exceed projected reimbursements. Accordingly, the Trustee's report also included a section under a hypothetical modification to current law that mostly dealt with maintaining physicians' reimbursement schedules – see dotted line on graphic below that portrays a more accurate condition than the current law condition described above, which is bad enough. I have advocated a premium support system as the solution for Medicare's financial problems since @ least 2012 – premium support will gradually phase-in thereby weaning people off Medicare while providing the freedom to choose whatever healthcare level of coverage each person prefers. The premium support system would not affect anyone age 55 or older or those currently on disability. Anyone age 54 or younger would switch to the premium support system when they turned 65 meaning the government would provide a demogrant for beneficiaries to purchase private insurance. The original amount of the demogrant would be sufficient for people age 65 the first year of the premium support program to buy the equivalent Medicare coverage in the open market. 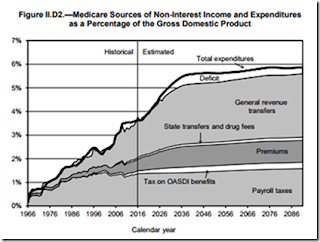 The premium support dynamic is clearly illustrated by looking @ the bottom curve on the following graphic that shows four cost trajectories illustrating the Medicare burden. The bottom curve is the only one that bends down – it is for premium support with a growth rate based on the Consumer Price Index (CPI). 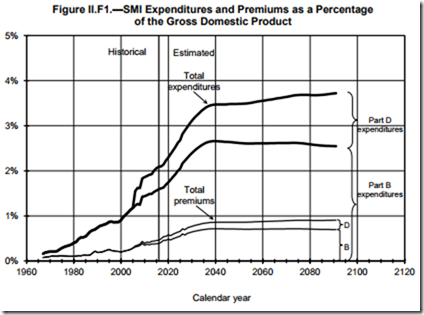 The cost curve bends down even faster if the premium support demogrant is frozen with no increase due to inflation. People age 54 & younger would follow a sliding scale with people in their 50s receiving appreciably more purchasing power from the demogrant than those just entering the workforce who would not rely on the government @ all when they turn 65. Ever since the early 1990s many companies, such as IBM, ConocoPhillips, Delta Airlines, & Coca Cola, set ceilings on how much money they would ever pay for retiree healthcare costs – this follows the principle of unindexed to inflation premium support that needs to be applied to Medicare as well. Younger employees & future retirees can see that their private sector employers or federal government will be providing less & less healthcare benefits each year as inflation keeps increasing their share but not their employers' or the government's. But not only large companies are trending in this direction to solve their healthcare cost problems – in 2017 sixteen percent of small businesses (3 to 49 employees) that did not provide specific healthcare insurance policies did give their employees some money toward purchasing their own plan themselves & in 2012 Michigan stopped offering retiree healthcare to new employees but instead, in a form of premium support, contributed an additional 2% of salaries to new employee 401(k) plans with the idea that this money could be used for healthcare needs in retirement. Michigan's retiree healthcare liabilities dropped about $20 billion since the program started. Medicare is well liked by seniors & what's not to like – good coverage (if you have supplementary Medigap coverage also) @ a subsidized rate where beneficiaries pay a fraction of the real cost – except that it is not financially sustainable. The above description of Medicare's funding problems presents a clear account of what lies ahead for unsuspecting seniors if a solution like the premium support system is not implemented. How unkind is it for our elected representatives to let the current Medicare condition continue until benefits start to be curtailed? It is the elderly & people over age 55 who are dependent on the Medicare programs who will be hurt the most when spending cuts occur. Just what will these people do then? "Your estimated benefits are based on current law. Congress has made changes to the law in the past and can do so at any time. The law governing benefit amounts may change because, by 2034, the payroll taxes collected will be enough to pay only about 77 percent of scheduled benefits." – from page 2 of sample statement on Social Security Administration website. 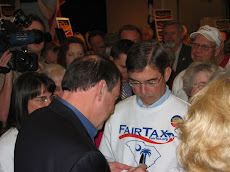 I have never met one person @ my FairTax seminars or anyone who has participated in radio or TV programs I have been on that was aware of this warning that plainly says that Social Security benefits will be reduced by 23% in the not too distant future unless changes are made to the Social Security entitlement program. 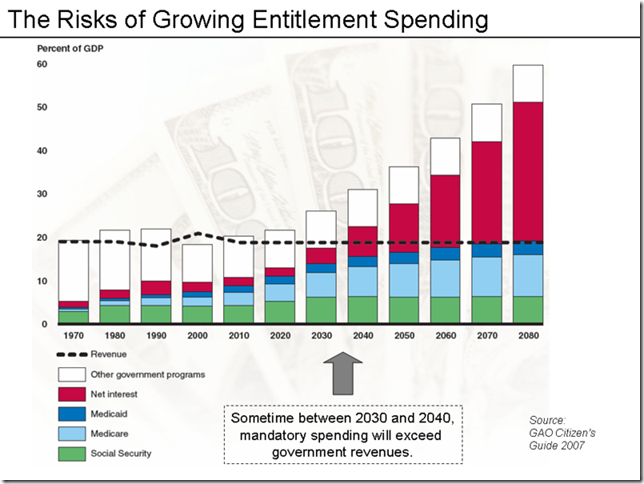 The above graphic shows the country's financial condition we are all familiar with in general terms – namely, that sometime between 2030 & 2040 Social Security, Medicare, Medicaid, & net interest on the national debt will exceed government revenues. 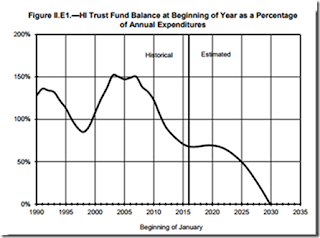 The above excerpt from the Social Security website personalizes this general problem – an individual receiving the average Social Security benefit of $1,404 per month in 2018 will see the benefit abruptly cut to $1,081 (in 2018 dollars) when the deceitfully named Social Security Trust Fund runs out of IOUs & the payroll taxes collected are not enough to pay scheduled benefits – this is currently estimated to happen in 2034. 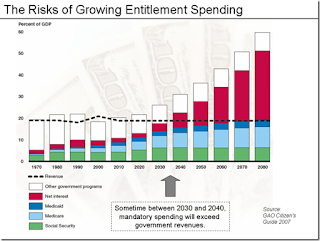 In addition, the above graphic shows the portion of government revenue available for Discretionary programs will be crowded out if no corrective action occurs. 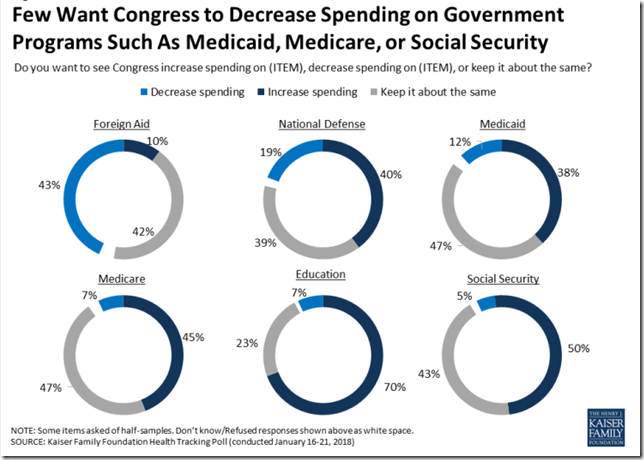 This post will examine why Social Security is out of control - cascading toward the type of abrupt cuts for current recipients described above - & what can be done to solve the problem. 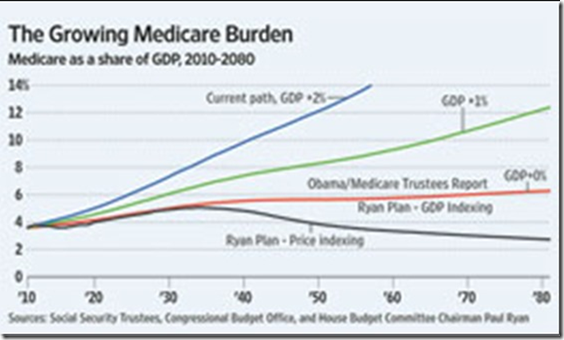 The next post will cover Medicare problems & solutions. 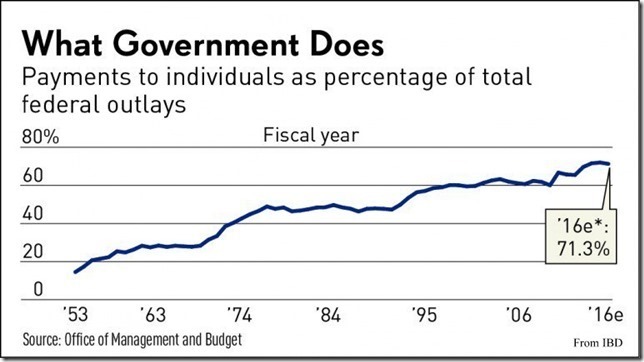 The problem with Social Security is that liabilities are growing faster than inflation or real GDP. 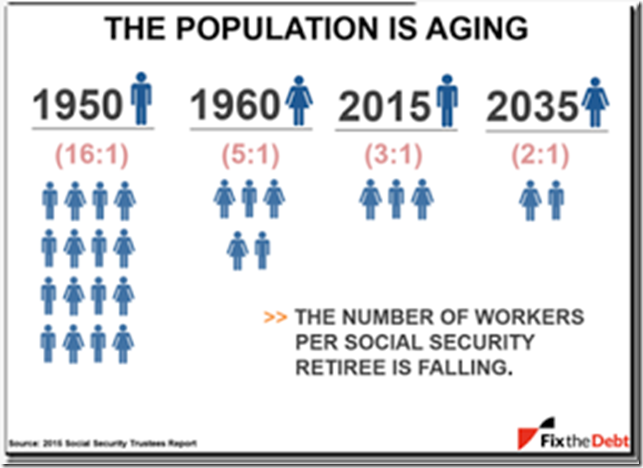 The declining ratio of workers to retirees (see table & graphic below) means that Social Security payments to beneficiaries won't be able to keep up with the future liabilities of the entitlement program which in turn will overwhelm the economy as shown on the above graphic. For instance, when three 2015 workers retire they will receive benefits based on two workers funding the system in 2035 – this is unsustainable. Social Security was originally a pay as you go system meaning that benefits were provided by then current payroll taxes. 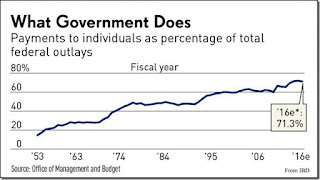 In the 1980s & 1990s the baby boom generation's payroll taxes exceeded the annual amount of benefits paid & the surplus was used to create a Social Security Trust Fund – money Congress used to fund other programs that were accounted for by issuing IOUs that now make up the contents of the trust fund: i.e., there is no real money in the Social Security Trust Fund, just IOUs. The reduction in benefits, currently estimated to be 23%, will occur when the last IOU is redeemed using money from the general treasury. 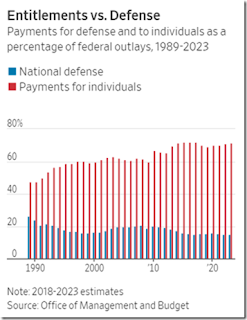 Social Security has been paying out more in benefits than it collects in taxes since 2010 thereby reducing the number of IOUs in the trust fund. The solution to the above described Social Security funding problem centers around the determination of a person's initial Social Security benefit – the monthly benefit when a recipient begins getting checks. This initial benefit is based on the average real wage growth of a person's earnings over their working lifetime. Real wage earnings growth is greater than inflation measures such as the Consumer Price Index (CPI) so in essence the government is guaranteeing a real positive return on everyone's financial participation in the Social Security program – a guarantee no other investor including the federal government has. In addition, to fund current Social Security benefit promises it will require a 50% increase in payroll taxes meaning we will sooner or later run out of our own money let alone other people's. Just reducing this initial benefit so that it is calculated based on the CPI rate instead of the wage rate solves the Social Security funding problem – Source Susan Lee column in the WSJ dated November 23, 2004 entitled All You Need To Know About Social Security. I have promoted, on RTE, the above solution to the Social Security funding problem several times since I first read about it in 2004. I know it will take a mindset change in our country but I bring it up again because we may have the perfect opportunity to implement it if we don't squander the potential increase in economic growth & the prosperity that comes with it that results from the recent tax legislation. The Tax Cuts & Jobs Act of 2017 includes many features that potentially will increase economic growth. Economic growth is determined by how many people are working, & how productive they are. Population growth drives economic growth because a larger population means more workers to produce & more consumers to buy things. The new tax legislation that went into effect on January 1 will take care of the productivity part of economic growth as documented in several posts the past two months. Check archives on RTE. So let's analyze the number of people working – although the U-3 headline unemployment rate is very low the January unemployment report released on Friday by the Labor Department shows there still are 451,000 people in U-6 who are too discouraged to look for work because they believe there is no work for them in America & five million more who want full time jobs but can only find part time work – in fact U-6 ticked up in January from 8.1% to 8.2%. Likewise, with some overlap, there are thousands in the 25 to 54 age group who are still not employed @ the prerecession level – twelve year later. I know some of these people – they are more interested in playing Pokémon Go & contemplating living off the inheritance their mother leaves them than thinking about a career in engineering that will help America grow – this mindset must change or the future of these people will be composed of only wealth spend down which will leave them penniless sooner than they think. In total there are over 95-million people in America that are not in the labor force – with regard to those of working age: Phil Gramm once told President Reagan that people will leave their wheelchairs when the economy grows. Legal immigration is also important in that we must bring in people who can immediately contribute to the economy's growth. See referenced post below for more examples of where workers will be found. President Trump's budget released last May called for 2.3% real economic growth in calendar year 2017 – so he was right on target – it was 2.3% in 2017. It was 1.5% in 2016 so the stage is set for improvement from BO's years with the first three full quarters of Trump's presidency producing GDP growth of 3.1%, 3.2%, & 2.6%. Trump's budget calls for 2.5% growth in 2018 & 2.8% in 2019 with 3.0% thereafter. 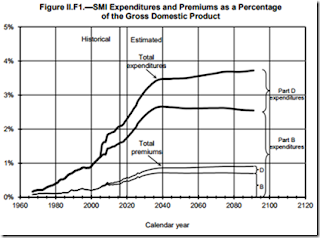 But economic growth in & of itself will not solve the Social Security funding problem – it needs another element or influence like the change to the CPI basis for determination of the initial benefit, because as the economy grows so do real wages meaning the Social Security liability grows right along with it in lockstep under the current wage growth benefit formula. What solid economic growth contributes to solving the Social Security funding problem is providing a sense of prosperity that makes a national pension system not seem so necessary – or @ least not one that went from 222,488 primary worker beneficiaries in 1940 to one that by December 2015 had Social Security beneficiaries totaling 40 million retired workers, 2.3 million spouses & children of retired workers, 6.1 million surviving children & spouses of deceased workers, & 10.8 million disabled workers & their eligible dependents. 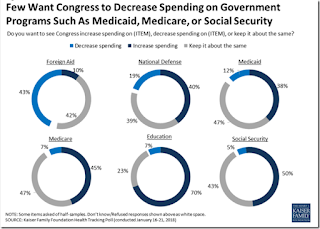 Source – Center On Budget & Policy Priorities. If improved prosperity is realized as a result of greater economic growth, than has been experienced in the U.S. in a long time, the timing is right to switch the Social Security benefits basis to the CPI & do away with the wage indexing formula. The phase in to the new system would not affect anyone age 55 or older. Anyone age 54 or younger would retain their wage base work years in the formula but would switch to the CPI basis immediately – so everyone would retain the portion of the existing system methodology up until the change in benefit basis from wage to CPI. 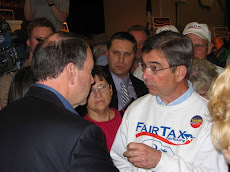 True, benefits eight years after the change in benefit basis, will start to be lower for those age 54 when the system change is made, - but the revised system would be on sound footing for everyone, especially younger workers, unlike the current system based on the wage indexing formula – where the choices in the near future are to raise payroll taxes 50% on younger workers (& all others) as indicated above, borrow hundreds of billions of dollars, or abruptly slash benefits 23% on current benefit recipients as the Social Security website indicates is a certainty under current law. Do your own calculation to see how much effect the change to the CPI formula would have on your personal Social Security benefits. Those age 55 & older – none. Those age 54 & younger would follow a sliding scale with people in their 50s receiving appreciably more than those just entering the workforce who would receive about 77% of the amount based on the wage index formula – a good verification of the Social Security Administration's calculation of the current cut to be expected after all of the IOUs in the trust fund are redeemed. Under the CPI based system Social Security would become financially sound – able to pay all benefits with no need for financial gimmicks – & if the needed mindset change produced enough courage the long debated change to privatizing @ least a portion of the Social Security taxes would be an additional benefit providing the chance to return benefits to a higher level while giving current workers a property right to the returns on the taxes they pay toward retirement. The above explanation of the Social Security funding problem shows the obvious predictable suffering & distress that will be realized by unsuspecting people in the not too distant future. Too bad that the selfishness of politicians & recipients of current benefits as well as those close to receiving benefits precludes working on a solution unless people of substance, who understand the problem that is so obvious, cry out in outrage for a solution like the one described above.